They’re Back! Led Zeppelin Has Announced That There Will Be A ‘Friends’ Reunion! Get ready to return to Central Perk, because rock legends Led Zeppelin just announced that there‘s going to be a Friends reunion! 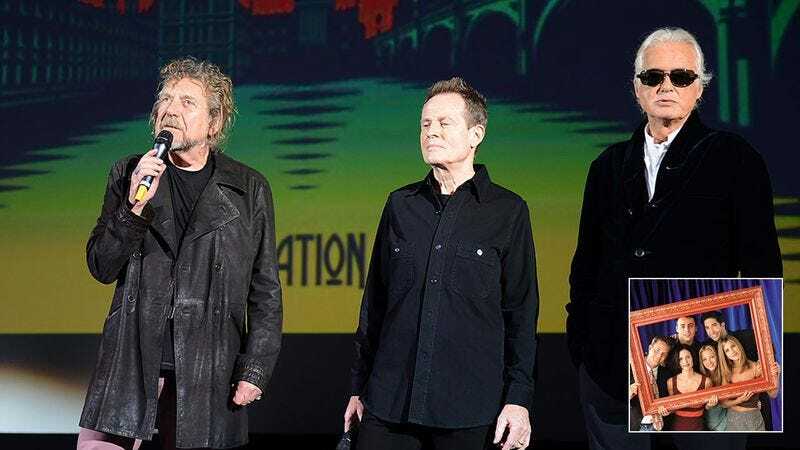 The three surviving members of the legendary classic rock band—singer Robert Plant, guitarist Jimmy Page, and bassist John Paul Jones—took the stage for a special press conference in London this morning and stated that the cast of the beloved sitcom would be returning to television. If you’re worried that the Friends reboot will lack the spirit and chemistry of the original sitcom, you can rest easy, because members of Led Zeppelin also announced that the reunion would feature all of the cast members from the original sitcom, and that original series creators Marta Kauffman and David Crane would be overseeing the show’s writing and production. In other words, this is going to be amazing! While the mood at Led Zeppelin’s amazing press conference was overwhelmingly celebratory, it was not without sadness. It was impossible not to feel the loss of Zeppelin’s legendary drummer, John Bonham, who passed away in 1980 and couldn’t be with the rest of the band to announce that Phoebe, Joey, and the rest of the cast would once again be getting up to mischief. Jimmy Page took a moment to address Bonham’s painful absence. If you’re a Friends fan, there’s a lot to get excited about. Just when we thought this incredible show was finished for good, along come hard rock pioneers Led Zeppelin to reveal that a reunion is just around the corner! So far, no one involved with Friends has confirmed the announcement.